Deciduous shrub, member of the Elaeagnaceae, and native to the US. They make very attractive shrubs and are often used as valuable wildlife food. They have small silver grey leaves, and bear small white flowers in spring, maturing into edible red berries in the late summer or fall. The flowers are dioecious (male or female), so male and female plants are needed to produce fruit. The shrubs are extremely hardy, withstanding very poor soils and dry windy or salty conditions with ease. They also make an excellent choice for use as hedges due to their rapid growth and spiny branches. The branches are very close growing and have a spreading form and very little pruning is required. 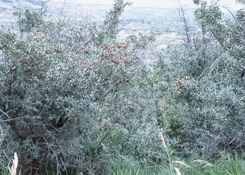 Shepherdia is also an excellent nitrogen fixing plant and is used for erosion control. Fruits are often dried and treated like currants or cooked for use in pies or jams. The fruit contains saponins which are reduced by cooking. Propagation can be performed by taking cuttings in late summer or early fall, though success is rather limited. Much simpler is to sow seed in late fall or early spring outdoors for natural stratification or by using an artificial method of stratification See Cold Stratification for more information. If artificially stratified, seeds should be soaked in warm water for 24 hours, then cold stratified for 90 days prior to sowing. Sow seed in pots orplug trays and keep moist at 70F. Seedlings should be transplanted to larger containers when about 6" in height. They may then be planted outdoors in their permanent location. Hardy to -40F (-40C); height: 12ft. Spread: 12ft.